Protecting your hair from the dangers of UV rays is as important as protecting your skin and eyes. The sun can dry out your hair and cause your color to fade. Your hair will be healthier, shinier, richer in color, and less dry if you protect it against sun damage. Many top hair care lines have created products that act like sunscreen for your hair. They come in all forms so you can choose the product that best suits your hair type and styling needs. 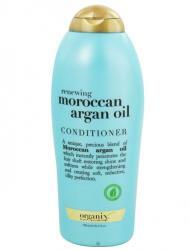 Organix Renewal Moroccan Argan Oil Shampoo uses the natural properties of vitamin E and argan oil, which has been used in beauty products for centuries, to restore hair's softness and shine while offering multi-UV protection and shielding hair from heat damage. This shampoo is good for all hair types but especially helpful for dry, damaged hair. It's ultra-moisturizing so it's great for thick, curly, and generally unruly hair because it helps smooth and control while softening. According to a review on SwatchAndLearn.com, the product's smoothing and protective capabilities are among its best attributes. This product is available at Ulta.com and in Ulta stores, and a number of additional retail locations, including a number of drugstores and e-commerce retailers. Expect to pay just under $8.00 for a 13-ounce bottle. Ojon Color Sustain Pro-Fade Fighter weekly conditioning treatment is designed specifically for color treated hair, but works great for all hair types. The rich conditioner combines a custom blend of Ojon's trademark oil with Tahitian Monoi and Jasmine Wax. This mix of ingredients provides an invisible shield that protects hair against fading from the effects of time and UV rays. If you're interested in purchasing this conditioner, it's available at online and in stores for around $30. Biosilk Glazing Gel, like all Biosilk products, is infused with actual silk proteins. The amino acids in silk help to strengthen and rejuvenate hair while naturally protecting it against the elements, including heat and UV rays. This light gel is great for curly, frizz prone, and oily hair because it provides a smooth, shiny look without weighing hair down. It is top rated by customers on big beauty retail sites including Amazon, Ulta and more. Reviewers comment on the lightness of the gel and it's superior frizz-control and heat protection. In addition to the sites and stores listed above, a 12 ounce bottle of Biosilk Glazing Gel is available at Ulta for about $15. Some Like It Hot Serum from TIGIBed Head uses natural oils including apricot, sunflower, and olive to provide weightless frizz control against heat and humidity. Hair will look shinier and smoother while being protected from the damage of heat styling and the sun. A review on The ART and SCIENCE of [beauty] raves about this Bed Head serum. The blog recommends it for people with humidity averse hair types and swears by it's ability to keep hair smooth and under control in any weather conditions. Bed Head products are widely available at drugstores including Walgreens and from websites like Drugstore.com. The product typically costs between $12 and $17 for a 3.38 ounce container. Aphogee Gloss Therapy Polisher Spray provides multi-UV and environmental protection. It also fights frizz and split ends with a custom ph optimized formula that promotes healthy, shiny hair. It's a great product for daily UV protection and is suitable for all hair types. Dull hair will especially benefit from the added shine. A review on MakeupAlley highlights the spray's effectiveness in extremely hot and humid conditions. It keeps hair smooth and sleek in summer months and helps protect it from drying out in colder weather. You can find 6-ounce bottles of Aphogee Gloss Therapy Polisher Spray for under $10 at popular beauty sites like House of Beauty. Terax Sculpting Wax contains olive butter for nourishment and sunscreen to protect hair from UVA/UVB rays. It provides a medium hold and gives hair texture while moisturizing and defending against damage. Benzophenone-3 is the active ingredient in the sunscreen; it provides UV protection for hair the same way a lotion does for skin. Terax wax is medium weight so it's not great for oily hair. It works really well for shorter hair styles that need some definition and dry, color treated hair lacking natural moisture and shine. A review on Folica.com raves about the ultra moisturizing effects of the wax. The olive oil gives hair a smooth appearance and healthy shine and is especially great for very dry hair. Terax Sculpting Wax is sold in 2-ounce pots at Amazon for under $10. It retails for between $15 and $20 at other locations including Beauty.com. Leonor Greyl Huile de Palme: Huile de Palme harnesses the natural properties of palm oil to heal, strengthen, and protect hair. Hair will be softer, shinier, and naturally resistant to the damaging rays of the sun. While its nourishing properties will help any hair type, this product is truly a must-have for anyone who spends lots of time at the beach or pool. It helps to rejuvenate hair from the drying effects of wind, salt, sun, and chlorine. Beauty in the Bag talks all about the incredible results but warns that buyers should be aware this product solidifies in cooler temperatures. This can make use somewhat of a process, but the results can be well worth the effort. You can buy this a 3.2 ounce bottle of this oil at online retailers including Derm Store and high-end department stores for around $50. Protecting yourself from the sun is important for numerous reasons, both medical and aesthetic. The benefits of sunblock for general health and the appearance of the skin have been known for decades, as has the importance of eye protection with sunglasses. It's also important to protect your hair, something that is not difficult to do. Start by choosing a product you normally use and replace it with one that offers UV protection. Hair products offering defense against the damaging heat and rays of the sun come in all forms so you can easily swap out one or two to start and go from there. Combining the nourishment of traditional hair products with the added benefits of UV protection will have your hair looking and feeling it's healthiest in no time.